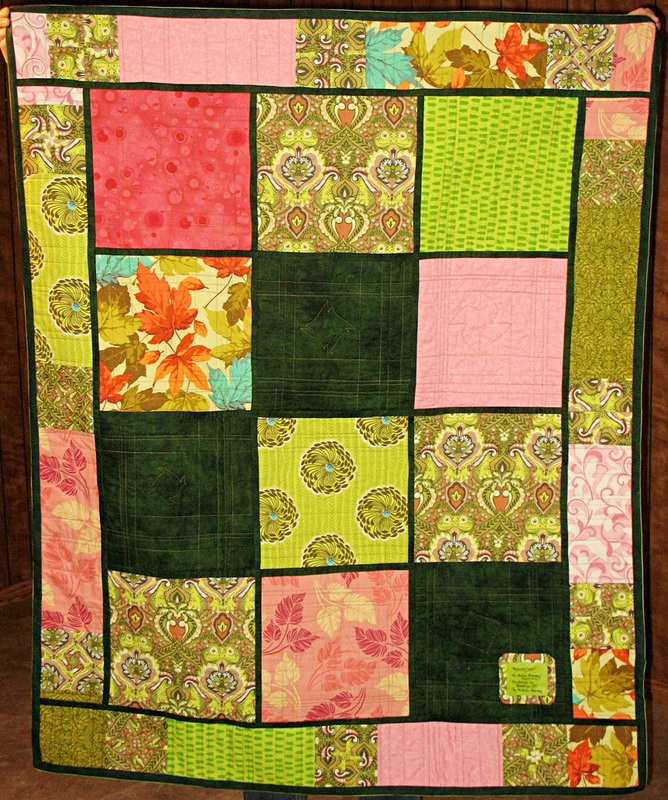 Can't Quit Quilting: AT LAST! 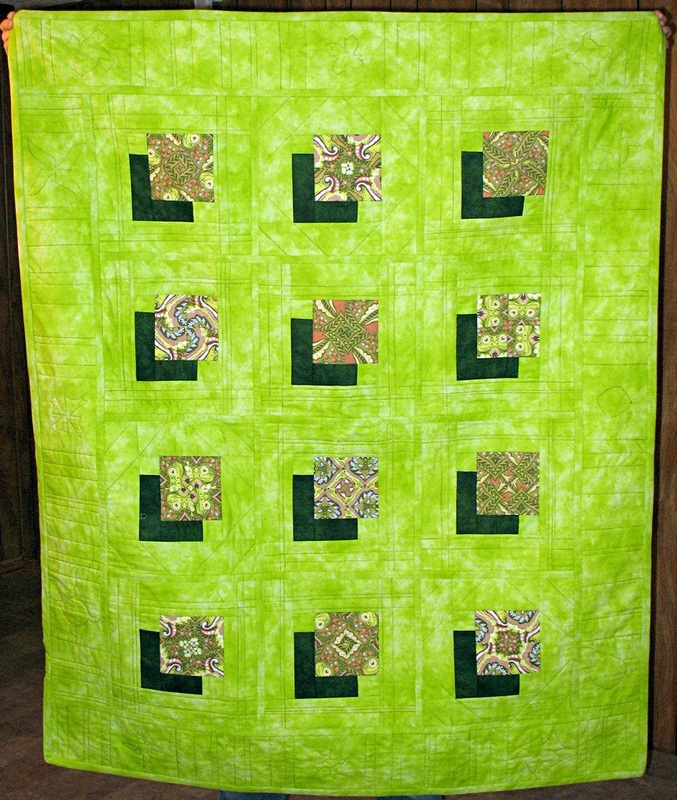 My sister finally (at least from my point of view) was able to get together with my niece and give her the quilt I made for her birthday as part of the Kaleidoscope Shadow quilt-as-you-go class taught by Judy Doenias at City Quilter. 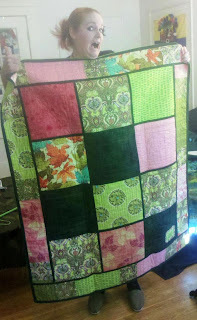 So, here at last are photos of the finished quilt. 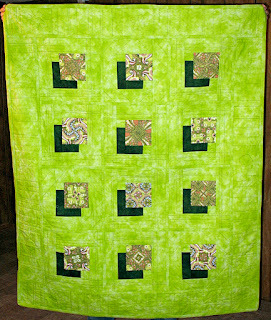 The front has 12 kaleidoscope blocks made from the fabric in the center of the top row of blocks on the back. The fabric is called "Prince Charming" by Tula Pink. You can't see it very well in the photo above, but there's a frog with a bug in his belly worked into the pattern with scrolls and berries. Charming indeed. I used a variety of fabrics on the back (for the first time) and am very happy with the result. I ended up making more kaleidoscopes than I used on the front and like how the spares worked in the border on the back. My sister reported that my niece likes the quilt, which was my goal all along. This photo appears to support that statement. Rallie gives it a thumbs-up. I look forward to making another kaleidoscope shadow quilt sometime soon. I have a few more gifts planned that are next in line though. (And maybe one for our home as well. I think my husband would like that.) Of course, the new City Quilter classes for the spring and summer were just posted online, so that's another reason/excuse to start another quilt.